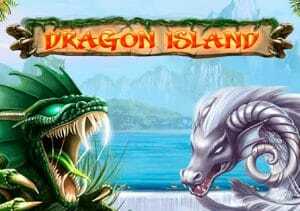 Head to a land that time forget where fire breathing creatures rule the skies in Dragon Island, a 5 reel and up to 30 payline video slot from Net Entertainment. This well-designed game comes with win both ways payouts, wild win multipliers that can boost payouts up to 8x and a bonus feature that awards up to 100 free spins with stacked wilds. Play from between 15p and £150 per spin. Visually, Dragon Island is nicely done – joining the lower value playing card symbols are 5 ornately drawn dragons. The one you’ll be hoping to see is the orange dragon. Land 5 of this one and you’ll pocket a payout of some 2,500 coins or 5,000 coins if win both ways is activated. Your first decision when opening up Dragon Island is whether to play with the Win Both Ways active – of course it will cost you extra, taking up the minimum play from 15p up to 30p per spin. As well as obviously doubling of the paylines, it comes with another tidy little extra, namely the Golden Wild feature. When this lands and forms part of a winning combination, the payout will be increased via a multiplier that can boost your wins by 2x right up to 8x. The other main extra on offer is the Free Spins feature which is triggered by landing the volcano scatter. Land 3 of these anywhere on the reels and you’ll win 3 times your total stake as well as 10 free spins. 4 scatters and the cash prizes increase to 10 times your stake plus 20 free spins. Land a full 5 volcanoes and you’ll pocket 100 times your total stake as well as earning 50 free spins. An expanded wild will be added to 1 randomly chosen reel on each of your free spins. Land 3 or more scatters anywhere on the reels during the feature and you’ll even more freebies to your total with up to 100 possible. The variance on Dragon Island is in the medium range with wins of over 2,200 times your stake on offer. The Golden Wild feature can certainly help things along in the base game, especially if you land the 5x multiplier. The best winning opportunities come in the Free Spins feature where the expanding wild reel can really deliver. Land a big haul of free spins here and these dragons can help you fly off with plenty of coins. If you like the look of this game, I recommend you try NetEnt’s high variance Dead or Alive – you won’t be disappointed.